SeaPort Enhanced or SeaPort-e is the US Navy's contracting vehicle of choice for the procurement of engineering, technical, logistics, program management, and financial support services. It is an indefinite-delivery/indefinite-quantity multiple award contract awarded by NAVSEA. SeaPort-e supports all cost reimbursable type contracts with the exception of T&M and sole source contracts. It has a 15 year period of performance, valid through April 2019. 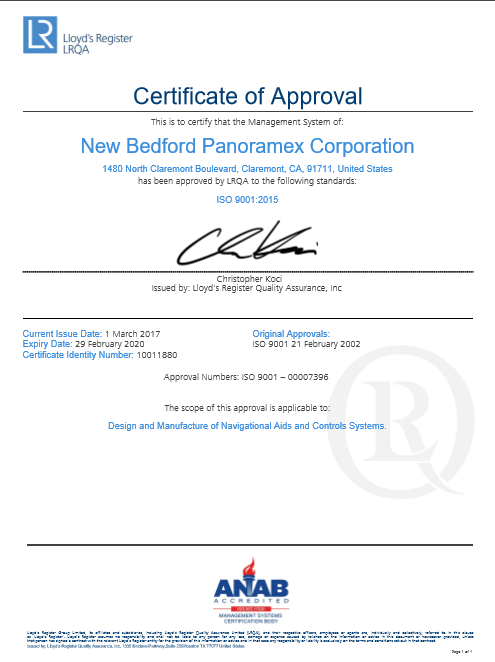 New Bedford Panoramex Corp is in five of seven geographic regions. Address: 1480 N. Claremont Blvd. Here at NBP, we have always said: “Quality is an essential component in everything we do.”, after over 50 years of business, we are are still committed to designing, producing, and delivering products and services that meet or exceed the quality requirements of our customers. Regular audits, multi level conformance checking, and independent ISO 9001-2015 certification is just a few steps taken to ensure all of NBP’s products & services are held to the highest standards. Our entire team is dedicated to continually improving the effectiveness of our quality assurance system by providing a framework for establishing and reviewing our quality objectives. NBP takes a tremendous amount of pride in manufacturing here in the United States and is always interested in receiving feedback from its customers, partners and end-users. We consider all feedback to be good feedback as it helps us to constantly improve our procedures, products and level of service. To send an Email to NBP corp.’s Quality Manager: MNIELSEN@NBPcorp.com. Bryce Nielsen Vice President Finance/ Contracts Mr. Nielsen is responsible for all aspects of Contract, Administration, business, and financial management at NBP. Mr. Nielsen has over 35 years of experience in FAA, DOD, DOE, as well as commercial contracts, administration, business, and financial management. Mr. Nielsen has a BA from Utah State University and a MBA from Brigham Young University. He reports to NBP’s President/CEO and has been an employee of NBP since 1983. Michael Brown Engineering/ Program Management Mr. Brown is NBP’s Engineering Manager. He has over 20 years of experience in managing multidiscipline engineering departments, experience encompassing petro-chemical, pulp and paper, gas, power, and other heavy industries. Product knowledge,spans pollution control, process control, instrumentation, chemical skids, safety systems, grass roots projects, and retrofit projects. Responsibilities include planning, implementing, and overseeing all engineering and program,management activities. Mr. Brown holds a Bachelor of Science Degree in Engineering. He reports to NBP’s General Manager and,has been an employee of NBP since 2014. Ken Castellanos Project Engineer Mr. Castellanos has worked in electronic hardware and software design for over 30,years. His designs include analog/mixed signal, RF, high-speed digital, and incorporated electronic equipment. He also works with layouts of electronic PCB designs including surface mount and thru-hole technology. Ken creates, develops, and debugs software, applications for micro-controllers, microprocessors and PLDs in assembly, C, and Vhdl. He is also involved in the design of ALSF, MALSR, RCS, and ICMS. He reports to NBP’s Engineering Manager and has been an employee of NBP since 1986. Victor Zamora Project Engineer Mr. Zamora has worked on several projects involving the design, manufacture, test, and installation of solar electronics and Bio Robotics. He has worked as a Test Engineer on products such as Programmable Logic Controllers (PLC’s) and other industrial electronics. Since joining NBP, Mr.,Zamora has worked with all facets of our RLMS products including sustaining, engineering, troubleshooting, test and installation. Mr. Zamora holds a Bachelor of Science degree in Engineering. He reports to NBP’s Engineering Manager and has been an employee of NBP since 2015. Ken Harter Manufacturing Manager Mr. Harter has over 43 years of experience in FAA, DOD, DOE, and commercial production of mechanical fabrication and electronics products. He is thoroughly knowledgeable in all aspects of production including assembly, soldering, conformal coating, mechanical tooling, machine shop programming and final assembly. He has been NBP's Production Manager for the past 37 years on various major programs including ON-143, ARMS, RRCS,,PAPI, ALSF, Localizer Antenna, Strap, and SLEP among many others. He reports to NBP’s General Manager and has been an employee of NBP since 1972. Fernando Ramirez Configuration Manager Mr. Ramirez has over 36 years of experience in the engineering,field. He began working in the,engineering services department responsible for generating and maintaining all design and drawing packages. In 2001 Mr. Ramirez was promoted to the,position of Engineering Services Manager, overseeing the duties of Configuration Management which includes configuration, identification, document control, release management, configuration status accounting, and configuration auditing. Since that time he has worked on all FAA programs, including the Light Emitting Diode (LED), Precision Approach Path Indicator, (PAPI) and the Replacement Lamp Monitoring Subsystem (RLMS). He graduated in,1979 with a degree in Mechanical Engineering Design from Los Angeles Trade,Technical college. He reports to NBP’s General Manager and has been an employee of NBP since 1990. Ken Gauthier Supply Chain Manager Mr. Gauthier has over 15 years supply chain management experience in the industry. He is thoroughly knowledgeable in material specification and,material/component availability and vendor qualifications.,He is responsible for the procurement, production planning & control, stockroom, and shipping & receiving departments. Mr. Gauthier holds a Bachelor of Science in Industrial Technology Manufacturing. He reports to NBP’s General Manager and has,been an employee of NBP since 2014. Michael Neilsen Quality Manager Mr. Nielsen is NBP’s Quality Manager and has over 20 years working and managing in the quality department. He is thoroughly knowledgeable in ISO 9001, AS9100, performing internal and vendor audits, vendor qualifications, corrective & preventive actions, and controlling non-conforming product. His professional career path has included working with contracts in military, space, FAA, customized computer systems, traffic, alternate energy solutions, cable tv and as technical product manager for specialized distribution products. His qualifications include Bachelor of Science Degree in Engineering and a certified lead auditor in AS9100:2009. He reports to NBP’s President/CEO and has been an employee of NBP since 2016.
as one of the principle software design engineers. Mr. Mayfield holds B.S. contractor in 1995 and has been an employee since 1996. Summary: This contract is provide all hardware and software related to the product lines listed below as well as Engineering Services, Site Surveys, Installations, Technical Support and Tooling & Test Equipment. Summary: This contract is to deliver approved LED PAPI Systems as well as Depot Test Equipment and Depot Spares to the FAA. This contract required the design and development of both hardware and software, training of customer personnel, Environmental Testing and an overall implementation plan for the LED PAPI System. Summary: This contract is to provide warranty technical support, repair and maintenance services for all 16 major U.S. airport sites that have installed Integrated Control and Monitoring Systems (ICMS). This support can include system repair and maintenance, site upgrade and installation, telephone and computer support as well as customer support on trouble shooting or problem analysis.